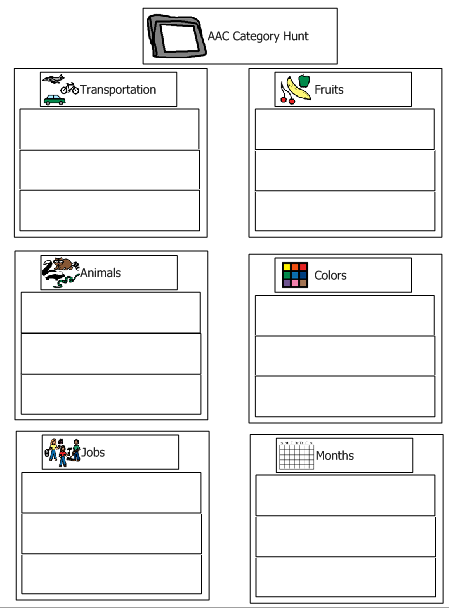 I wanted to share some simple worksheets I created for students, staff, and parents to familiarize themselves a bit more with the core vocabulary on the students’ AAC devices. I recently had parent-teacher conferences and, with most of my students using AAC, I stressed that the student needs to use the device at home as well as at school. After the parents protested by explaining that they didn’t need to use it at home because they can understand the student without it, I emphasized the importance of preparing them for the adult service world and that the student had the right to be understood by more people! I also appealed to the parents’ hearts, explaining that I knew without a doubt that all of the students had more to say than they were currently able to with their vocalizations and/or devices. We can all improve! After hearing that, all parents agreed that they need to incorporate the AAC device more at home. The biggest concern, however, was that the parent had no idea how to use the device or where anything was. I had one parent explain that when he is trying to show his son where an item is, he always just opened the keyboard and typed the word out. This was frustrating to the student, who had poor spelling ability, and prevented the parent from learning to navigate the vocabulary. I showed the parents the ‘Find Word’ feature that is available in many of the WordPower vocabularies and also assured the parents that you need to learn how the vocabularies are set up and, when you get the gist of the organization method, it will get a lot easier! I do a lot of activities in the classroom to help students and staff better know their way around their core vocabularies. 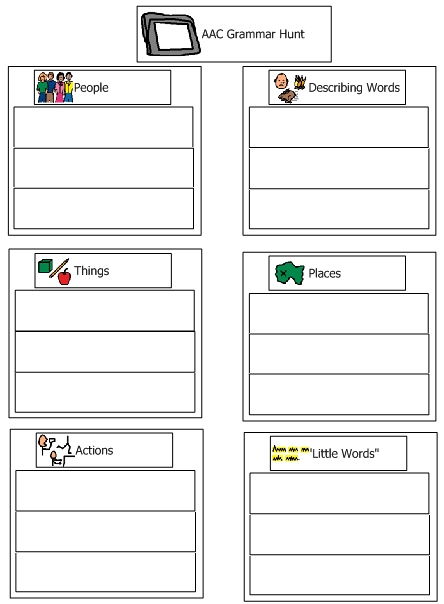 These activities cannot stand in isolation—students will also need to be explicitly taught through modeling and other structured activities what the words mean and how to use them functionally. However, they do meet the goal of helping people learn where to find words quickly and how the system is organized. Whenever I complete activities like these in the classroom, I send them home as “homework” for parents to complete as well!